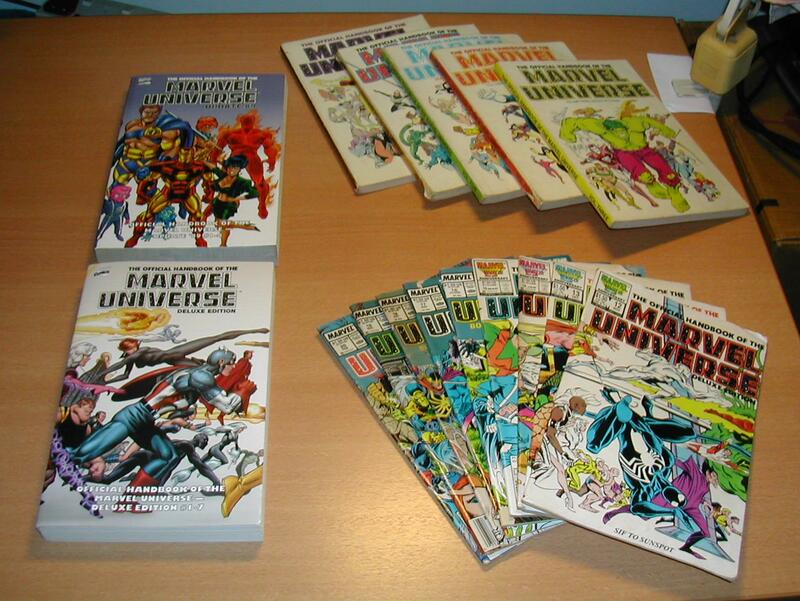 Recently, I have managed to collect the entire series of the Official Handbook of the Marvel Universe Deluxe Edition. The Marvel Universe Handbook is an A-to-Z encyclopedic guide to nearly all the characters and places in the Marvel Comics Universe, and the Deluxe Edition were initially released in 20 comic issues followed by 8 updates issues. The comics were then reprinted into 10 book volumes, and more recently, they were all again reprinted into 4 book volumes refered to as the “Essential” volumes. I got to know about Marvel comics back in primary school, and while in secondary school, I inherited 4 book volumes (Vol. 4, 5, 6, 9) from a friend who didn’t want them anymore. And over the years, I have managed to acquire several separate issues (#12 to 20) plus one book volume (Vol. 3). With what I have acquired, I only needed to find issues #1, 2, 3, & 4 to have a complete A-to-Z collection. And amazingly, while I was walking around Suntec City, I spotted that the Marvel Universe Essential volumes actually existed and were on sale. And there I bought Essential Marvel Universe Vol. 1, which is a compliation of #1-7. And I was damned happy about it. Returning home, I surfed the Internet and found that there was also an Essential volume for the Updates. Following this, I went to Kinokuniya where I was able to buy the Essential Updates Volume. And now, behold, I got them all! Well, the only drawback about the Essential Volumes is that, the entries are all printed in black and white, as per all Marvel Essential comic reprints. Maybe I would continue to keep a lookout for the issues that I lack, so that I could obtain colour-printed character entries. But in any case, there is no rush. It has taken me years to get a complete collection, and if I do come across the issues I want, so much the better! Here are Chucky the evil doll, and the Psycho Guy Norman Bates. I got these figures years ago when someone left them behind when he left the army camp, and I collected them. This is a Kilrathi Pilot from the “Wing Commander” movie. “Wing Commander” is a famous series of spaceflight combat computer games, but the movie adaptation of the game leaves much to be desired, both for die-hard fans and the usual movie goer. I have acquired new figures from Babylon 5 and Stargate. I wanted a cool alien figure, one of the “greys” type. I thought Thor fits the bill nicely. Do view them in the Photos section. My toys say “Hi” to the world ! 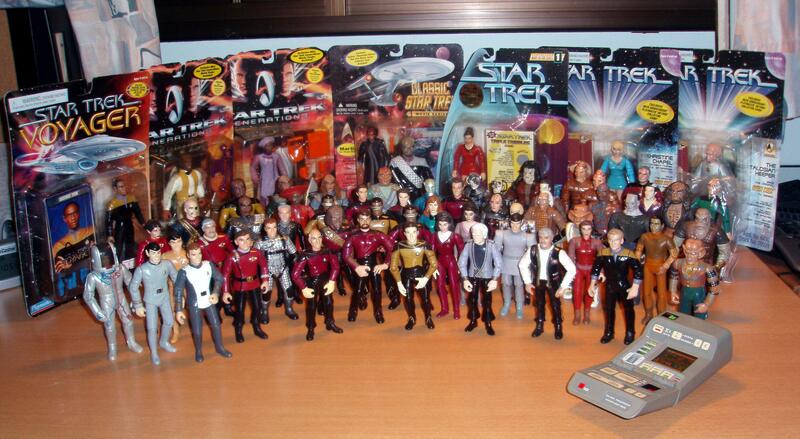 Added the tricorder since it is made by the same company Playmates. See if you can spot the doubles (or if you want to be technically right, the multiples).